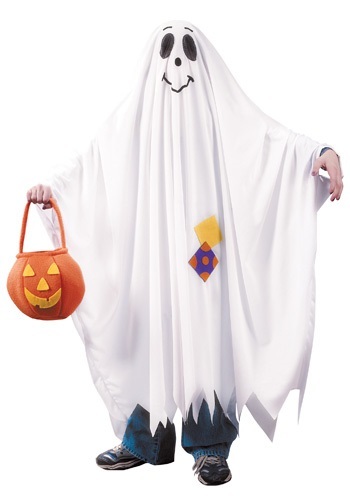 Most ghosts will be howling with their “Boos” this Halloween, but your kiddo will be shouting “Woo!” when he's wearing this Kids Friendly Ghost Costume! Look at the smile on this ghost's face! Its so friendly that even Casper may have to pass the title of Friendly Ghost over to your little one. Get your camera ready! This is one ghost that you'll be delighted to see in your photo albums, years from now when you want to look back at the good old days. Seeing your kiddo wearing this smiling phantom's face and knowing that the smile under the costume is even bigger will bring joy to your heart.